IEX published a report this week titled “The Cost of Exchange Services” which is a first-of-its-kind, inside look at how exchanges provide and price market data. Not only does IEX provide a detailed breakdown of market data feeds and physical connectivity costs but they detail the process of how an exchange delivers data. The numbers are simply astounding. We urge you to read the entire IEX paper to really understand what the market data fee debate is all about. 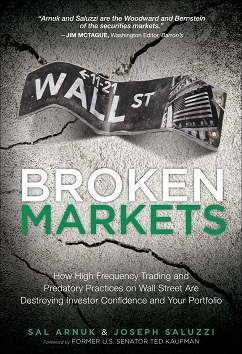 Order-by-order depth of book is the most expensive and most detailed level of market data that exchanges sell. The data includes detailed information on order entry, revisions and cancellations. Order id numbers, which are attached to these messages, allow consumers of these feeds to build their own consolidated order book which updates in nanoseconds. Think of the order book reengineering that could occur for those that have access to this data. It is the holy grail of market data. It is the jet fuel that propels the super-fast HFT engine. Without this data, colocation and other physical connectivity would be much less valuable. On the flip side, in order to take advantage of this granular high-speed data, firms much also purchase other hardware products from the exchanges. Between the connectivity costs and data feeds, the cost of an order-by-order depth of book display is in the millions of dollars per year. See page 14 of the IEX report for a detailed discussion of order-by-order depth of book feeds and page 19 for the cost of the data feeds. Aggregated depth of book is the aggregated number of shares available at each price level within the order book. Exchanges that offer this feed sell it at a discounted price compared to order-by-order feeds. But there is only one exchange, IEX, which does not offer order-by-order depth of book and chooses to only supply an aggregated feed. According to IEX, they “believe order-by-order data provides an unfair information advantage to recipients that can fully leverage the data, leaving other participants at a disadvantage.” This is one of the reasons why we think IEX is so successful at crossing larger trades and why we think there is very little information leakage on IEX. Without the order-by-order feed, high-speed traders have a much more difficult time modeling order flow behavior. For example, that VWAP order which post to the near-side on Nasdaq and sits there for 10 seconds before being revised to a midpoint and then being revised to cross the spread on a scheduled basis is pretty easy to spot on an order-by-order feed. Exchanges charge less than $100k per year for aggregated data fees but IEX gives their aggregated data feed away for free. The SIP simply displays the best bid and offers that are available. According to the CTA, “The Security Information Processor (SIP) links the U.S. markets by processing and consolidating all protected bid/ask quotes and trades from every trading venue into a single, easily consumed data feed.” Because it aggregates quotes from 13 stock exchanges, there is a bit of latency involved when processing but this has improved dramatically in recent years. There is no depth of book data displayed through the SIP – only top of book is displayed. The SIP is normally used by many non-professional investors since there is no cost to them for this data. While the market data fee debate rages, it’s important to realize that the classes of market data are different. HFT’s and market makers like to complain about the cost of their First Class seat but yet they continue to demand that seat. If they want to sit in Economy Plus, there are plenty of seats and the fare is much less. But the problem is they need to sit in First Class because without that seat they might as well not get on the plane. The airlines (NYSE,Nasdaq,Cboe) know this very well and to keep their high-speed traders coming back to First Class, they offer them Rewards Miles, otherwise known as rebates which can offset the cost of the First Class ticket. And as long as the airlines keep up their market share, they get their own perks in the form of a percentage of the yearly $400-$500 million market data revenue pot. So you see, there are many conflicts of interests here. But we think we have a simple solution to the problem. Only aggregated feeds should be allowed to be offered by exchanges. This would still provide the depth of book necessary for professional investors to make investment decisions but it would eliminate the information leakage associated with order-by-order feeds. Seems simple but just watch those First Class customers demand to get back those costly order-by-order feeds. They don’t want to sit in Economy or Economy Plus with the rest of us. And that is the reason why exchanges charge so much for market data. The laws of supply and demand always dictate price.